This Sequin Bag comes with a shoulder strap. We are manufacturer and exporter of evening party clutches. We also make fashion hand bags as well. This party clutch is made by our trained skilled crafts person. We have many styles to offer in this category. Description - Handmade bags portray snappy designs, that render elegance and smartness. Strings passed through grommets provide users' hands full comfort. 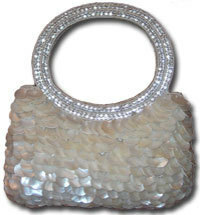 Banking on the expertise of our experts, our firm is betrothed in presenting standard quality collection of Sequin Bags. Multicolor sequins and beads and place color matches with dress of any color. 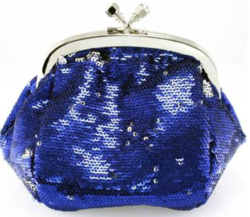 Our ladies bag find exquisite sequin work which are perfect for any occasion and are available at cost effective prices. The bag has sufficient space with good number of pockets. The eye catching color combination of black and other colors like red and green makes it more attractive. Intricately designed bags with minute sequence work are a perfect masterpiece that reflect the finesse with which our craftsmen fabricate these bags. It is available in enchanting colors and fine finish that enhances the persona of the user who is carrying it. We are engaged in offering an amazing range of supreme quality ladies bag with hand embroidery and sequin work to our clients. Offered in diverse styles, designs, patterns, pleasing color combinations and sizes to complement the requirements of clients. Our offered bags are highly appreciated by our clients for their features like attractive designs, tear & wear resistance and fine finish.